A Tribute to my Mom. 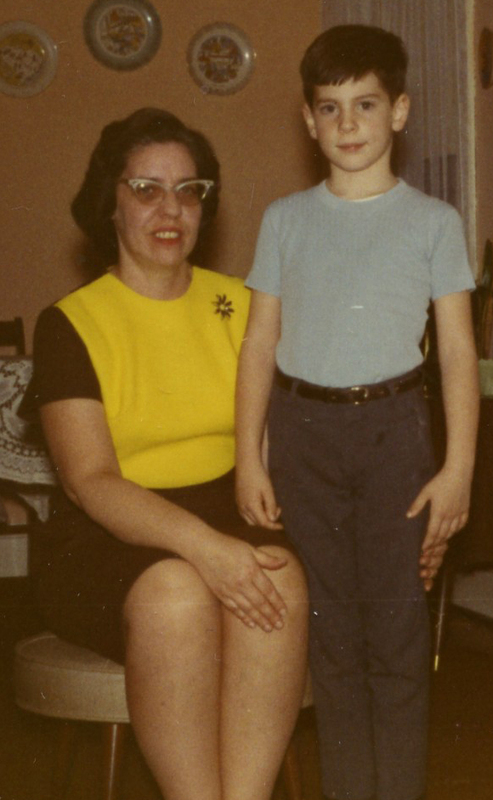 My mother, Mary Lou C., was a complex person. In so many ways she lived two lives. Her life until May 14th, 1968 – and her life since. She was a difficult woman to love at times. She could be demanding and critical, short on praise and quick to correct. She was moody. She was also very proud and loving. I lived alone with her for most of 15 years from 1968 to 1983. I saw and experienced it all. She disliked every girl I ever dated before my wife. She loved my wife, and was spot on with that! When I was a teen I worked at the drug store with her part time. There were many “regular” customers there. Every one of them would come and praise me for my grades, my debate trophies, my newspaper writing. All because she had spent so much time bragging about them. She taught me that the real value of hard work wasn’t measured in dollars and cents, or in praise and accolades – because those are fleeting and undependable – but in the inner satisfaction of knowing you did your very best. She called out my half-baked attempts at things like cleaning my room, washing windows all the way to the corners with no streaks, cutting the grass and trimming it properly and my homework. She knew I was capable of better, and she pushed me to do my best, and for that I thank her. I was never allowed to quit anything mid-way. Because of that I learned to deal with obstacles and overcome them. While she would defend me after the fact from the bullies in my life, she didn’t shield me from them. I learned to stand up for myself and what is right, even if it wasn’t popular – skills that serve me well even today. She taught me to be accountable. If you do wrong, admit it and take the medicine and do better next time. Don’t make excuses or alibis. She thrived on being able to have some measure of control in her life. I believe that in her later years she would choose when she would answer the phone because she wanted that bit of control. She was a woman with passionate beliefs and convictions, and she wasn’t afraid to let you know what they were. She had a deep sense of propriety, and held herself to it. Mom had a life that included hardships. She endured the divorce of her parents and separation from her siblings at a time when it was far more taboo than it is today. At the age of 40 she found herself widowed with a six year old son. But, she played the hand that she was dealt. She managed to raise me through 12 years of Catholic School, and she paid off her mortgage. All on Social Security, and the near-minimum wage job at a corner drug store. A job she took leave from every summer to be with me until I reached high school. She raised four beautiful, well-fed, exceptional children. Trips to Cedar Point, but only after lunch at The Old Prague restaurant in Vermillion and teasing me that I would be left at McGarveys because “they love kids”. But most of all she loved my dad, and her children, and her grandchildren. There are some people in the world who can evoke a response with just the mention of their names. You instantly know who they are, and conjur up their personalities. People like Elvis, Gandhi and Cher…. And Mary Lou. Who is parked in front of my house? We are the 13th house from the corner, why are they turning around in our driveway? There is no such thing as delinquent children, only delinquent parents. Treat everyone you meet as though you know their heart is breaking, because often you will be right. Today I think about both of those things because they remind me not only of her, but of so many of us who came in contact with her. So, after 84 years, 2 months, and 8 days on earth…and 44 years and 6 days after the death of her one true love, God called my mother home. Many of us here today – in small ways and large – have been shaped by the influence and the life of Mary C. And, while we might sometimes want to deny or minimize some aspects of that influence, I challenge us all to find that influence within ourselves, embrace it and wear our “Mary Lou ness”, as a badge of honor. This entry was posted in Inspirational People, Personal Reflections and tagged bobby-c, eulogy. Bookmark the permalink. 3 Responses to A Tribute to my Mom. I know you mentioned this, but when I have friends in the hospital, I send a card EVERY damn day. It’s fun to get real mail these days.